I would like to expand on what I said about P-6 Neiguan last month. P-6 Neiguan is a complex point, rich in clinical applications. P-6 is closely connected to the Stomach channel and, for this reason, it is a major point to make Stomach-Qi descend. For this reason, it treats vomiting, nausea, belching and acid reflux. In order to make Stomach-Qi descend, P-6 combines very well with Ren-13 Shangwan and ST-21 Liangmen. 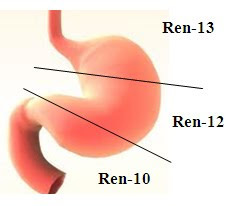 Notice that Ren-13 is better than Ren-12 at making Stomach-Qi descend because it treats specifically the upper part of the stomach. Besides making Stomach-Qi descend, P-6 also makes Heart-Qi descend. Interestingly, Heart-Qi not descending also causes nausea and vomiting; therefore, when we use P-6 for nausea and vomiting we are acting both on the Stomach and the Heart channel. 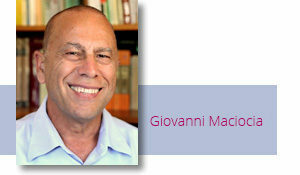 How do we know whether nausea in a patient is due to rebellious Stomach-Qi or rebellious Heart-Qi? In two ways. Firstly, from the pulse: in case of rebellious Stomach-Qi, we will feel that on the right-Guan position (feeling Tight or very slightly Overflowing). In case of rebellious Heart-Qi, the left-Cun position will be slightly Overflowing. Secondly, when nausea and vomiting are strongly associated with the emotional state (i.e. the patient feels nausea when depressed, anxious, worried or guilty), then they are due to Heart-Qi not descending. There is a close relationship between the Stomach and the Heart that has many clinical applications and repercussions. Indeed, in some of the old classics, epigastric pain, i.e. pain below the xyphoid process was called xin tong i.e. Aheart pain@. Modern Chinese books say that the old doctors somehow Aconfused@ stomach with heart pain. I do not agree with this view. I think that the old doctors knew perfectly well the difference between a stomach and a heart pain.The fact is that there is a broad overlap between the Heart and Stomach both from the point of view of organs and that of channels. One way in which the channels of the Heart and Stomach overlap is through the Divergent Stomach channel and the Great Luo of the Stomach. In fact, the Stomach Divergent channel ascends in the abdomen and then enters the stomach, spleen and heart. 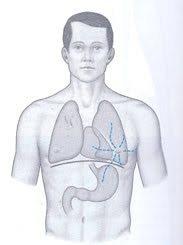 On the other hand, the Great Luo of the Stomach starts in the chest, penetrates the diaphragm, connects with the lungs and exits below the left breast. The pulsation of the left ventricle felt in the fifth intercostal space is called the pulsation of Xu Li and Xu Li is another name for the Great Luo of the Stomach. Therefore, while what we feel in the fifth intercostal space is obviously the heart, from a Chinese perspective, it is also the beating of the Xu Li and of the Zong Qi (the Qi of Heart and Lungs in the chest). What this means in clinical practice, is that treatment of the Stomach channel is important to regulate the Heart both on a physical and a mental-emotional level. On a physical level, treatment of ST-36 and ST-40 is important to regulate the rhythm of the heart when it is irregular or fast and to make Heart-Qi descend when there is nausea. On an emotional level, treatment of ST-40 calms the Mind and makes Heart-Qi descend, allaying anxiety and worry.Not by chance, some of the symptoms of myocardial infarction are often digestive such as belching, acid reflux, nausea and vomiting.